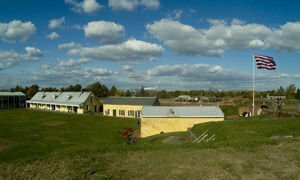 Fort Mifflin in the U.S. state of Philadelphia is the historic fortress, which was the scene of one of the most epic battles during the War of Independence in the U.S. Fort Mifflin is considered the oldest in the country fort. Here, in November 1777 about 350 American soldiers were killed during the battle with the British, who bombed the stronghold of their ships. Fort Mifflin today is celebrated as one of the most important and major sights of the country. The huge complex was partially restored. Located not so far is Mud Island, Delaware River at the mouth of the river with Schuylkill. Fort Mifflin stands south of Philadelphia near the Philadelphia International Airport, less than 30 minutes from Valley Brandywine. The original name of the fort is Fort Island Battery, and often, it is called the Fortress of Mud Island. Fort Mifflin is a strategically important fortress in the history of the United States, which today is perceived as a symbol of the heroism of the U.S. Army. The complex is spread on about 40 acres and consisted of eight buildings, which endured the attacks of 40 British guns, that shelled the castle every 20 minutes. The castle is named after General Thomas Mifflin, who was governor of Pennsylvania and led the battle in 1777. Thanks to his actions at Fort Mifflin, it gives enough time for George Washington to regroup the forces at Valley Forge, to resist the invasion of the British in Philadelphia. In a letter, Washington wrote that protecting the Delaware River is "essential for all of America." Fort Mifflin was built in 1771 and is continuously used by the U.S. Army until 1952. After the bombing in 1777, the castle was demolished and rebuilt, in 1795 and is named Fort Mifflin. In 1798, work began on construction of new buildings, which occupy the preceding grounds, but the work was completed two years later. In the 19th century Fort Mifflin was occupied several times and abandoned twice. Today, the amount of Fort Mifflin interest by tourists is huge. The castle is open to the public from May to November, between 10:00 am . - 16:00 pm each day, closed only on Monday and Tuesday. The entrance ticket for adults is $ 6 for children under 12 D - $ 3, but for kids under age 5, access is free. For visitors to Fort Mifflin, a souvenir shop is open, selling replicas of historical objects. You can even buy chocolates in colonial style. Around the castle, you can picnic or walk around the walls.